Tablas Creek Vineyard Blog: Veraison! This week, we're seeing the first signs of veraison in the vineyard. This means the clock is ticking... we figure on an average of about 45 days between the end of veraison and the beginning of harvest. As usual, we're seeing Syrah start veraison first, although we've seen signs of it in all our red varietals this week. The grape cluster above is one of the Syrah mother vines that we have in pots outside our tasting room. Many people don't realize that white grapes go through veraison too; they don't turn color as dramatically as the reds do, but they shift subtly from plant-green (the same color as the stems and shoots) to a more yellow- or gold-green. Veraison also marks a dramatic acceleration in the accumulation of sugars in the grapes. Before this point in the summer, grapes are growing, accumulating mass in both skins and pulp. After this, the grapes don't grow any larger, but their sugar content climbs and their acid content declines. In fact, between veraison and harvest, the grapes lose a little mass. Late in the summer, most grapevines are under stress, and water supplies are low, and when you pick, they've typically lost between 5% and 10% of their mass from their peak in mid-summer. 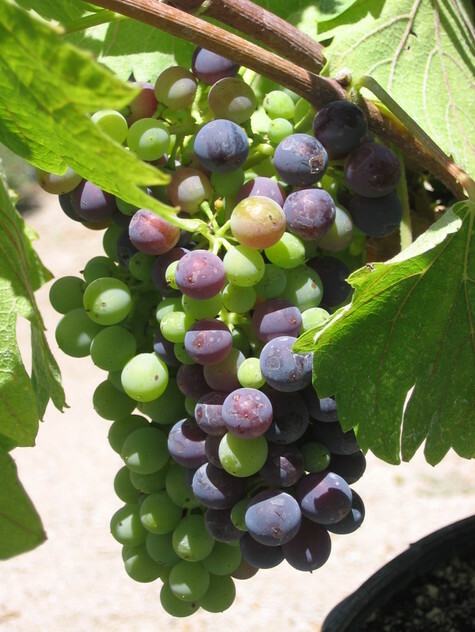 Another veraison photo (of Mourvedre) is below. 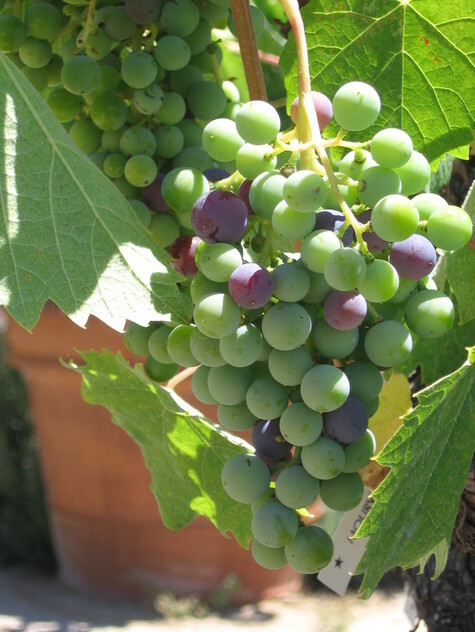 Note that veraison is less advanced in the later-ripening Mourvedre grape.